This major work comprises a comprehensive study of Eastern and Western esoteric streams and the occult powers that stand behind them. In Part 1 Prokofieff discusses the spiritual movement of Agni Yoga, presented to the world by Helena Roerich and her husband, the painter Nicholas Roerich. 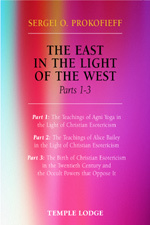 Part 2 focuses on the teachings developed by Alice Bailey, whilst Part 3 considers the relationship between Eastern and Western spiritual masters and the occult streams they represent. The first two Parts of the book give descriptions of both the Roerichs' and Alice Bailey's philosophy, based on their own perspective, together with anthroposophical commentaries that give an understanding of these two streams in the light of modern Christian esotericism. As Prokofieff points out, both the Roerichs and Bailey were convinced that the occult teachers who inspired them were the same as those referred to by the founder of Theosophy, Helena Blavatsky. Part 3 deals directly with the mystery of the Eastern teachers, or mahatmas, and their relationship to Christian esotericism. On the basis of extensive research, Prokofieff comes to the startling conclusion that the occultists whom both the Roerichs and Alice Bailey named as their leaders actually have nothing in common with Blavatsky's Eastern mahatmas. In Prokofieff's words: 'Hence... one has to do not with the Eastern mahatmas but with quite different occultists who had illicitly appropriated their names and then tried - while deliberately misleading their followers - to attain their highly dubious occult political aims with the help of the occult movements which had already been initiated.' Prokofieff argues that this appropriation led to a distortion of the age-old Eastern philosophies, giving them an anti-Christian character, and led to phenomena such as 'occult materialism', insidious political goals, and prophecies of a physically incarnating 'Messiah'. Previously available only in German as three separate books, with just an early version of Part 1 published in English, this long-awaited translation of Prokofieff's incisive study offers a fine schooling in discernment, judgement and spiritual insight. SERGEI O. PROKOFIEFF, born in Moscow in 1954, studied painting and art history at the Moscow School of Art. He encountered anthroposophy in his youth, and soon made the decision to devote his life to it. He has been active as an author and lecturer since 1982, and in 1991 he co-founded the Anthroposophical Society in Russia. In Easter 2001 he became a member of the Executive Council of the General Anthroposophical Society in Dornach. He is the author of many books, twenty-one of which are now available in English translation.